The focus of my blog is to review book series and not individual novels, but writers are going to continue writing novels within a series even after I have done my review, so I plan on reviewing the individual novels as they come into circulation. 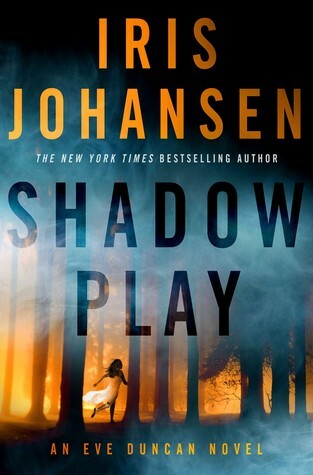 Iris Johansen has just recently added book #19, Shadow Play, to the Eve Duncan series. I have a love/hate relationship with the Eve Duncan series. I started reading the series years ago starting with the first novel in the series, The Face of Deception. As an aficionado of crime thrillers in particular forensic thrillers, I am always on the lookout for the next series to read, and as a result, the Eve Duncan series showed up in my search mainly because Eve Duncan is a forensic sculptor. The series began as a decent crime thriller with Duncan’s murdered daughter, Bonnie, appearing to Eve in her dreams. So at first, Bonnie was a figment of Eve’s imagination, however, that quickly changed as the series progressed, Bonnie was no longer a specter within Eve’s mind, but appears as a true ethereal being. As the series progresses, Johansen wasn’t satisfied with just a ghost but decided to add psychics as well as vampire-like characters and, as far as I am concerned, the series goes downhill from there. Though I have a certain revulsion to this series, I also have a strange yet compelling desire to follow Eve Duncan in her next adventure. It is not unlike the need to get a good glimpse of a car accident as I am driving past. Perhaps it is my desire to see what new fantastical character that Johansen can create or perhaps chuckle at the absurd dialog that occurs between Eve and her FBI/navy seal/cop husband Joe Quinn, but I can’t stop myself from reading this series. Shadow Play is the latest addition to the Eve Duncan series and Johansen doesn’t disappoint if telepathy and ghost are an interest to you. Duncan is approached by a phantom of a murdered child whose skull Duncan is reconstructing. Duncan, of course, cannot ignore the needs of this child to find her murderer, so she becomes more heavily involved in the investigation and reluctantly drags along her more than willing to please husband, Joe Quinn. Duncan also requests the help from a friend that fans of the series will recognize, Margaret Douglas, who has the ability to read an animal’s mind. We are also introduced to a new character, Sheriff John Nalchek of Sonderville, California, who is the lucky fellow that finds the grave of the murdered girl. With the exception of having something seemingly to hide, he appears to be perfectly normal with no paranormal attributes. I do believe this is a character that we will see more of with continued additions to the series. Overall, Shadow Play is entertaining and I believe fans of this series will enjoy it. Johansen does end the story with an interesting cliff hanger which means, of course, I will have to read the next book when it comes out. I would like to thank NetGalley for my Advance Reader Copy of Shadow Play. Posted in Crime Thriller, Forensic Thriller.Tagged Book Review, Book Review Blog, books, Crime Thriller, eve duncan, Forensic Thriller, iris johansen, Thriller.